There is no fully reliable official data available concerning the number of Internet users in Poland - this conclusion is inevitable when reviewing research results which can differ by as much as two times. A reasonable estimate based on the number of Internet hosts (i.e. the number that can be measured quite accurately) would give only about 1-2 million Internet users. An approximate estimate based on my own unpublished analysis of the number of ICQ users in different countries would suggest that there are at most 3 million Internet users in Poland. Several other sources suggest that it is about 2 million, while there are also published estimates of 4 million. In any case, 3%, 5% or even 10% of the population online places Poland at the tail end of the European countries, and also well behind the Czechs and Hungarians. Why are there such large discrepancies among these data? And why is the Internet in its infant, underdeveloped stage in Poland? For years, like in many Western European countries, the Internet has not been treated as an important issue by the Polish government. On the other side of the Western border, where state intervention has not been exercised either, the growth was nonetheless fast due to a well-developed telecommunications infrastructure. At the same time in Poland, owning a telephone at home is still a problem, and the policies of the monopolistic, state-owned telecommunications company, TPSA, undermine competition on the market and free growth of the Internet industry. It is worth looking at the number of women Internet users. This gives important information not only about the total number of users online, but also may give some insight into many interesting social aspects specific to the countries studied. 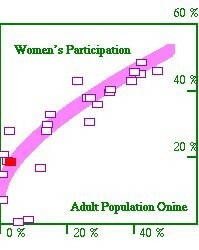 The picture shows the percentage of women online as a function of the entire population online. The data used are mostly from the Nua web site, http://www.nua.ie/. This is probably the only source available for free on the Internet containing a large amount of this type of information related to Internet development around the world. This information should, however, be treated with some caution. First, the way that it is presented forced me to do some guessing and to re-calculate the required data, which was not always based on precise information. Second, many inconsistencies can be found among reports presented by various research agencies, and it also seems that sometimes some of these agencies present research results in a way that best accommodates the rules of omnipresent political correctness. Nevertheless, the figure shown here correctly reflects the general gender breakdown of Internet users. The solid line is drawn only to guide the eyes. The precise relationship among the variables discussed is governed by many factors that are not well-known and are country-specific, influenced by local cultural and social factors. The position of Poland on this graph is not impressive. With about 3-5% of the population as Internet users and 18% of those being women (see the results of recent studies conducted by the Academy of Economics in Krakow at http://badanie.ae.krakow.pl/), we fall close to countries like Russia or China and well below the numbers characteristic of the Western European population. A more detailed description of the data, including references, can be found at http://www.iyp.org/internet/. In the most developed countries, women constitute almost 50% of all Internet users at the moment. The curve seems to show an ever-increasing percentage of women using the Internet, and this number is far from reaching a plateau. Hence, we may expect that within a few years, women will start to dominate the Internet.